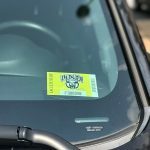 Students, faculty and staff of the university are required to immediately obtain and display a parking permit or decal. UCA ID is required to obtain a permit or decal. Only one permit may be issued per person. A vehicle and a motorcycle or moped permit can be combined per person. Motorcycle or moped parking areas are designated on the campus. The permit decal must be placed on the inside of the windshield on the driver’s side with the front facing out. The decal is repositionable and transferable to any vehicle the owner parks on campus. Replacement of lost decals are available for a $5.00 fee and the old decal becomes deactivated. Fees for permits and fines can be processed online (my.uca.edu) and Student Accounts in Bernard Hall. Fines double after 30 days of ticket issuance.